SpaceX is set to send an uncrewed Dragon capsule to the International Space Station this weekend in one of the most anticipated launches of 2019. A successful test would pave the way for a crewed mission later in the year—and the subsequent return of America’s ability to launch astronauts into space on its own terms. As difficult and frustrating as it is to believe, the United States has not had the ability to deliver astronauts into space without the help of foreign partners since the retirement of the Space Shuttle Program in 2011. This is the status of the trailblazing space agency that landed on the Moon in 1969, operates multiple probes on Mars, and has three spacecraft currently hurtling toward or through interstellar space (Voyagers 1 and 2 and New Horizons, in case you were wondering). Mercifully, this impairment could soon come to a welcome end. Early Saturday morning, an uncrewed SpaceX Crew Dragon spacecraft will launch atop a SpaceX Falcon 9 rocket at NASA’s Kennedy Space Center in the US state of Florida. Should the test be successful, it will “be the first time a commercially built and operated American rocket and spacecraft designed for humans will launch to the space station,” said NASA in an agency press release. The SpaceX Demo-1 flight test to the ISS is scheduled for Saturday 2 March. NASA’s coverage of the testflight will begin at 7:00 am, with liftoff scheduled for 7:48 am (all times in GMT). It’s not the best timing for many viewers, but the launch will happen at “roughly the moment Earth’s rotation carries the rocket into the plane of the space station’s orbit,” which happens to be the “only way current rockets can rendezvous with an orbital target moving at nearly five miles per second,” according to SpaceFlightNow. If you’re awake at that time, you’ll be able to watch the launch live at NASA TV. In the event that SpaceX and NASA are forced to cancel Saturday’s launch, the next windows of opportunity will be on 5 and 9 March, per SpaceFlight Now. The Crew Dragon is scheduled to autonomously rendezvous and dock with the ISS on Sunday 3 March at 10:44 am ,with the hatch opening planned for 1:45 pm. On Friday 8 March at 7:00 am, the hatch will close, and at 12:30 pm Crew Dragon will de-orbit and re-enter Earth’s atmosphere. The spacecraft is expected to splash down in the Atlantic Ocean about 230 miles east of the launch site, reports SpaceFlight Now. Again, you can watch these events unfold live on NASA TV. 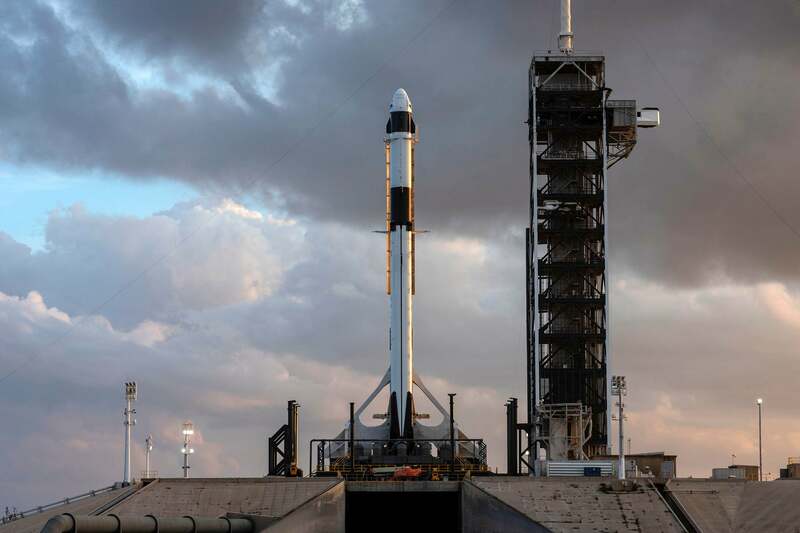 Demo-1 will be a big test for NASA’s $6.8 billion (£5.1 billion) Commercial Crew Program and for SpaceX’s Falcon 9 and the experimental crew capsule. The Falcon 9 has already proven its worth as a reliable launch vehicle, having participated in 21 missions in 2018 alone, but the rocket has been equipped with an updated and improved Merlin 1D engine. During the test, both NASA and SpaceX will carefully monitor ground systems, in-orbit operations, docking and landing procedures, and many other elements. Everything needs to go according to spec if the vehicle is to be certified as fit for human occupancy. Assuming the test goes well and the Crew Dragon is certified, a subsequent test called Demo-2 will happen in July, with NASA astronauts Douglas G. Hurley and Robert L. Behnken hitching a ride to the ISS aboard the capsule. Prior to Demo-2, however, NASA and SpaceX will conduct an important abort test of the system in June.